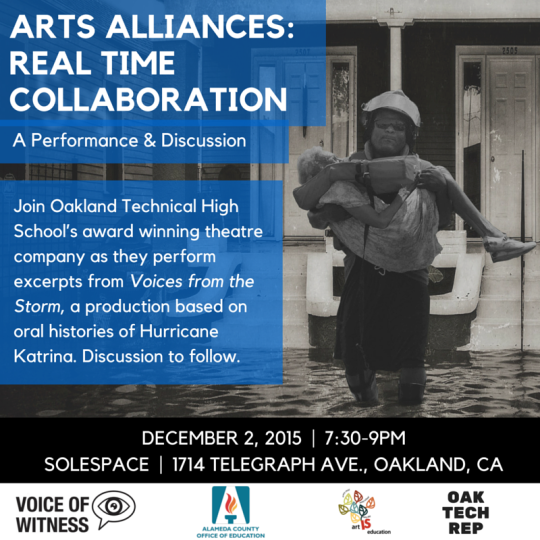 Come join OakTech Rep, Oakland Technical High School’s award winning theatre company, as they perform excerpts from their recent production Voices from the Storm. Based on oral histories from 13 people from New Orleans who lived through Hurricane Katrina, this devised work was adapted from the Voice of Witness oral history collection Voices from the Storm: The People of New Orleans on Hurricane Katrina and its Aftermath. The Alameda County Office of Education’s (ACOE) Integrated Learning Department will be co-hosting the event. The event will also feature a panel discussion with OakTech Rep, their Drama Director Ena Dallas, and ACOE Integrated Learning Specialist Jessa Brie Moreno. The group will discuss the creative process and the larger implications of integrated arts learning partnerships between local schools and non-profits. See upcoming Voice of Witness events here.